When you want the best cleaning performance to eliminate tough stains, grime, and dirt, there are two options to choose from. The first option is using hot water and the second option is using pressure washer detergent. You can even be adventurous and try the two methods together for a superb cleaning performance. Unfortunately, most residential and commercial pressure washers are not built to handle or operate with boiling water. However, most, if not all pressure washers are built to accommodate the use of detergent. That is why our guide focuses on pressure washer soap as a way to achieve the best cleaning results. The list is revised regularly. Last, this page was edited on 6 July 2018. 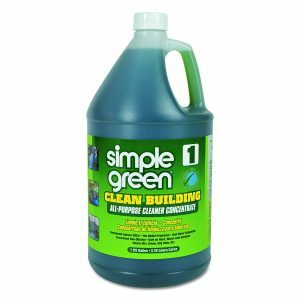 The Simple Green 11001 is an all-purpose pressure washer detergent. This detergent cleans dirt on every surface you apply it. This liquid detergent comes in a concentrated solution form and is filled in a reusable 1-gallon plastic bottle. True to its name, the Simple Green 11001 features a green color and is eco-friendly as it’s made of biodegradable ingredients. This liquid detergent is also hypoallergenic and fragrance-free meaning even hyper-sensitive people can use it to clean their property. As an all-purpose detergent, the Simple Green 11001 can be used to clean any surface as long as the surface is water safe. During application, you can apply this detergent manually or choose to use it with the pressure washer. Instructions are provided on the bottle to make sure you get the application process right. Despite being eco-friendly, the Simple Green 11001 is tough on dirt and grime; it meets the Green Seal GS-37 standard. The GS-37 standard measures the effectiveness of cleaning products in industrial environments. Therefore, the Simple Green 11001 is safe to use in residential, commercial, industrial and institutional environments. If you own a Sun Joe pressure washer, the Sun Joe SPX-HDC1G is the most suitable pressure washer detergent to buy for your machine. This is not to say that the detergent can be only used in Sun Joe pressure washers; it can be used in any brand of pressure washers. 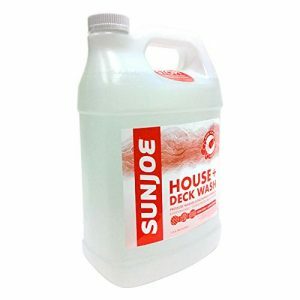 The Sun Joe SPX-HDC1G is a concentrated detergent formula and comes in a reusable 1-gallon plastic bottle. The liquid detergent features a colorless look and is both eco-friendly and human-friendly. This is because it features bio-degradable substances for environmental safety and is non-toxic, bleach-free, and fragrance-free for human use. As long as the surface you are cleaning is water-ready, you can use this liquid detergent. 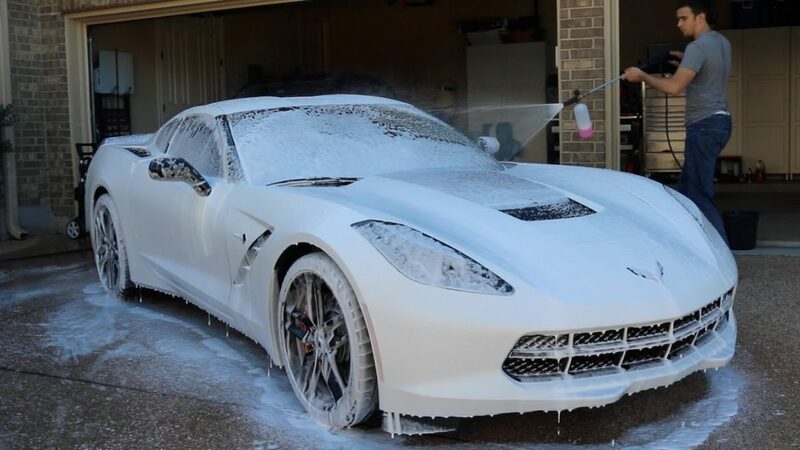 It gives a thorough cleaning performance. For effective results, use SPX-HDC1G with a mop or brush to get rid of stubborn stains and dirt. The application is super easy with this detergent. What’s more, it also comes with instructional guidelines on how to use it with your pressure washer. Depending on your cleaning style and preference, you can decide to apply the detergent manually or automatically. It can be done using your washer’s soap spray nozzle. The Karcher cleaning detergent is the third best pressure washer detergent in the market for its ability to deliver a quick cleaning performance. This liquid detergent features a green color and comes in an innovative 1-quart plastic bottle. The bottle has two openings and a measuring compartment for precise dilution. 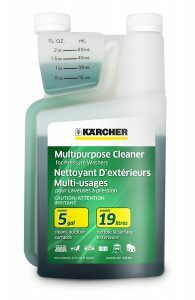 Karcher’s 1-quart liquid detergent comes highly concentrated and can make up to 5-gallons of a soapy solution to use for your cleaning activities. Just like the two pressure washer detergents featured above, the Karcher detergent features bio-degradable ingredients. It is non-toxic and fragrance-free for human use and environmental friendliness. The Karcher detergent can be used for various surfaces including patios, windows, vehicles, as well as steel, concrete, and brick surfaces. The powerful Karcher detergent produces a class-leading performance. And can be used in various environments such as residential, commercial, institutional and industrial environments. If you want a better cleaning performance or you want to decontaminate the area you are cleaning, then pressure washer detergent is what you need. When buying the detergent, you can opt for the concentrated liquid detergent which comes packed in liquid bottles. You can also opt for the powder detergent which should be mixed with water before use. Normally, the detergents come with instructions on how to dilute them into proper proportions. If you get the dilution proportions wrong, you will not get an efficient clean if the detergent used was too little. On the other hand, if the detergent exceeds the recommended amount, the solution becomes too thick and you risk damaging the washer’s pump. When it comes to application, the detergents can be applied manually to the surface or be added to the washer for spraying the surface that needs cleaning. If you are applying the detergent manually, first wet the surface you’re cleaning then spread the detergent to cover every inch of the surface. When every inch is covered, turn on your washer and spray the surface with clean water. Most pressure washer manufacturers recommend the liquid detergent as it is easier to use and is more eco-friendly. Also, most professional cleaners use the liquid detergent. If you’re thinking of buying powder detergent for your pressure washer, make sure you get a brand that is friendly to your washer and learn the dilution proportions. Pressure washer detergents are tough on stains, grime, mold and other forms of dirt but are gentle on surfaces. As long as you have the correct attachment for your pressure washer, you can apply the detergent to any surface you wish. So whether you are cleaning your car, your brick walls and floors, concrete walls, garage doors, steel surfaces, windows, driveways, sidewalks, etc. You can use pressure washer detergent for thorough cleaning. Unless you have an industrial pressure washer, avoid using hot water to achieve the perfect cleaning performance. Industrial pressure washers have pumps that are built to withstand boiling-temperature water while other types of pressure washers will probably get damaged by the intense heat. However, you need not worry because pressure washer soap is just as effective at removing grime and dirt from pressure washers. Liquid detergents are the best but you can also opt for powder detergents for your pressure washer. Lastly, the Simple Green 11001 is our best pick as we believe it to be the best all-purpose pressure washer detergent.